About Payment, Insurance, Hours etc. MDMA Assisted Psychotherapy for PTSD: A Psychedelic Cure? Over several decades I’ve felt a subtle, yet growing call to revisit my relationship with psychedelics. This call, similar to the one that beckons me to travel to India, whispers to me regularly suggesting that I have more to learn from psychedelics than the mostly frightening and disturbing experiences I had as a curious teenager. Although until now I’ve done little more than make note of this call….I have been paying attention to its persistent presence and I am open to what it wants to teach me. I’m slow but sure! Fast-forward four and a half decades and thousands of hours of Continuing Education / certification training later and you’ll know me to be quite accomplished at the treatment of Trauma and PTSD. Treatment however is a relative term in this field of practice because for all my efforts and learning the cutting edges of trauma treatment, the work is still hard and often very slow. It has been hard to define what a “cure” looks like although we have thankfully moved from the limited solutions of helping people only cope with the symptoms of a chronic illness to discovering means of effectively helping many patients to completely resolve their traumatic memories and live symptom free. But many is not enough! It is often the nature of our brain/mind/body to attempt to manage the painful injuries that cause PTSD by employing something called “avoidance”. It makes sense! If we can find ways to not think about, feel or sometimes even know the depth of what hurt us then we can get on with our daily life right? Like when we break a bone….. if we just ignore it and keep on trying to live our lives, everything will get back to normal. OK…so you can see where I’m headed, while avoidance does “help” in some ways, it tends to have very serious consequences and prevents us from really getting on with life. The moral of the story is this: In order to treat PTSD effectively we have to manage avoidance and fear so we can SAFELY revisit the terrible and typically overwhelming experiences that led to its development. Once we can do this safely, the brain/mind/body are wired to heal themselves much like a broken bone, when set and stabilized properly, will heal most completely. Remove the dirt, clean the wound and bandage it and our amazing bodies typically do the rest! Believe it or not, our brain/mind wants to heal psychological injury in a similar fashion but we’ve struggled to find ways to help this happen. It is early March 2019 and I’m sitting in a room with 50+ other clinicians, researchers and psychedelic medicine professionals from all over the globe watching and listening intently to researchers Michael and Annie Mithoefer present their methods and findings on the successful treatment of Complex PTSD (Post-Traumatic Stress Disorder) in a patient/participant group identified as “treatment resistant”. The Mithoefers are researching the use of the drug MDMA (the pure version of a street drug know as “Ecstasy”) and how it is enabling people with complex cases of PTSD to not avoid their emotional wounds, to put their overwhelming experiences into perspective, to SAFELY feel and know -whatever they need to feel and know- in order to heal themselves and to re-enter there lives fully. For me, hearing and watching this is nothing short of a miracle (a word I do not generally use). Their research, sponsored by the Multidisciplinary Association for Psychedelic Studies (MAPS – a 501(c)(3), Not-For-Profit research and educational organization) is now in its third phase and based of the findings from each phase of the study, the US Food and Drug Administration has granted MDMA Assisted Psychotherapy for PTSD a “Breakthrough Therapy” designation. This is a REALLY BIG DEAL….PLEASE PAY ATTENTION! I’ve been treating PTSD and trauma for most of my career and I’ve been excited about each new model of therapy and intervention that I’ve added to my repertoire, always hopeful that my skills would help lessen the suffering of the human beings who trusted me with their care. At this training, I sat with my colleagues reviewing and discussing hours of video tape recordings documenting the Mithoefer’s research using MDMA. I watched as they gently guided warriors, broken from combat in the Middle East and civilians wounded by very broken caregivers and/or from violent confrontations. They guided the participants to listen the “The Medicine” (viz. MDMA) and consult with their “Inner Healing Intelligence”, to notice what was happening in their bodies and to stay as close to what they were experiencing as possible. MDMA has properties that seem perfectly tailored to help treat PTSD. First, It helps dampen a structure in the brain called the Amygdala – a sort of fear signal detector that becomes overly active with PTSD and contributes to many symptoms. Next, MDMA helps the patient to gain clear access to memories that have been previously avoided while also allowing those memories to be rewritten with new more appropriate information that is more adaptive to the present day (example: Before: “I”m going to die!” After: “It’s over…I survived and I’m OK!”). It’s important to note the memories are not erased or altered in some way that changes their factual nature but they are changed in this way: They are typically given a new meaning by the patient, one that is often understanding, forgiving, kind and coherent. The MDMA helps create the capacity to stay close to these memories/feelings/experience while not being overwhelmed by them. In fact, it appears to offer a clear ability to observe, often with a benevolent perspective, things that were previously the source of tremendous fear, shame, pain and judgement. Finally, the drug increases the release of the hormone Oxytocin, often referred to as the “love hormone” or “bonding hormone”. 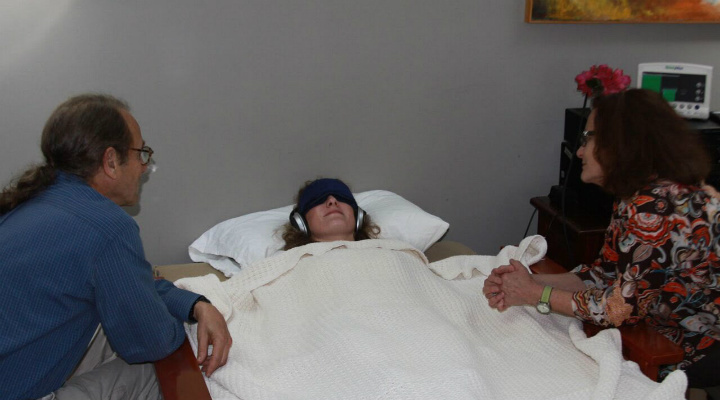 Oxytocin helps the participant feel safe, bonded with and trusting of the process and the therapist team during the lengthy (8+ hour) MDMA therapy sessions. As we watched the videos of each participant, supported by the properties of the MDMA and the gentle and limited direction of the team of therapists, a consistent theme emerged: The participants were healing, at a very deep level, from severe PTSD. The fact of this has been demonstrated by the science, the research. More than 80% of the participants, now years out from their original 2 or 3 Eight-hour MDMA therapy sessions are no longer showing clinical evidence of PTSD. I’m still trying to wrap my head around what I’ve witnessed BUT I feel deeply in my gut that we are on the brink of a method that can bring great healing to terrible trauma and perhaps begin to interrupt the deadly cycle of untreated trauma the drives so much suffering in our world. Making MDMA accessible to those most in need of it, especially in marginalized and undeserved communities and in corners of the world marred by generations of war will be a formidable challenge. We are at an important next frontier, the groundwork of which has been laid by the shamans and by indigenous peoples for thousands of years, nurtured by those willing to work outside of the law because of a commitment to use the healing properties of psychedelic medicines to heal trauma and now by those scientists determined to investigate the role that these medicines might play in healing the mind/body/spirit. I’m very excited to be a part of this next wave of treatment and the possibilities it offers to the world and each of us. Learn to Manage Stress By Living From Your Heart.